Do I need an Advisory Report completing as well? Advisory Reports (AR) provide information about the way energy is managed and used within a building. They provide recommendations for improving energy efficiency which can help reduce energy bills if successfully implemented. Even where they are not required, it is often beneficial to have the AR for a building completed or updated. This is particularly true when the energy assessor has to complete a site visit to issue the DEC as the additional work for the assessor is limited and this should be reflected in the assessment price. In England & Wales, a valid Advisory Report is legally required to be in place before a DEC is issued. In reality, they are usually both added to the national register at the same time when required but they can be completed separately. The Advisory Report must be for the same building and occupier as the DEC so they should both be accessible under the same entry on the register. It is the responsibility of the energy assessor to check the register to ensure that the AR is in place before lodging the DEC. 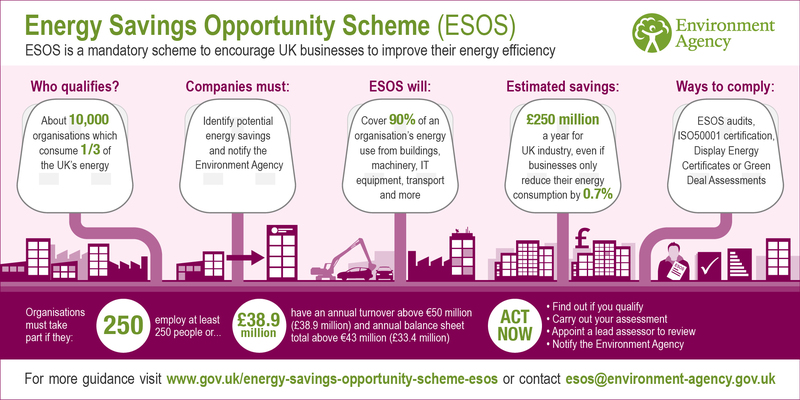 In Scotland, Advisory Reports are voluntary but will be required if it is intended to use the DEC within the Energy Saving Opportunities Scheme (ESOS). What is a “Building” for DEC purposes? Mechanical ventilation (this means the supply of fresh air and extraction of stale air – not just an extraction fan). It is not uncommon for a site to have multiple buildings or a large building built is multiple phases. If two or more buildings on the same site are linked by a fully enclosed structure consisting of a roof and walls, even if the link is not itself conditioned, then the combined buildings can be considered a single building for DEC purposes providing they have not been designed or altered to be used separately (usually by separate occupiers). This approach is particularly sensible when the different parts are serviced by the same common systems and where sufficient sub-metering is not in place. However, they may still be treated separately which can be useful in identifying energy efficiency improvements and monitoring energy usage. NB: Since February 2009 site based DECs and ARs no longer meet the requirements of the legislation. 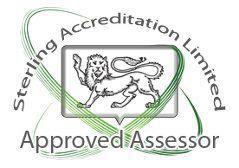 All qualifying buildings on a site must now have their own Display Energy Certificate and Advisory Report. How do I register a MEES exemption on the PRS Exemption Register? What evidence is required? All exemptions claimed by landlords to improving domestic properties with an EPC rating at F or G must be registered on the PRS Exemptions Register. This is an online process and does not cost anything to complete but you will need to have the correct supporting evidence available when you make your application. In addition to registering exemptions, you can also search for details of exemptions that have already been registered. It is very important that you recognise that a single property may be subject to a number of different exemptions that apply to different improvements. An exemption from one improvement does not exempt a landlord from making other relevant improvements. Additionally, you will need to ensure that you have completed the correct processes and gathered sufficient evidence before registering an exemption. There are significant penalties for registering a false exemption on the PRS Exemptions Register. The Department for Business, Energy & Industrial Strategy (BEIS) have issued the guidance below regarding the minimum evidence required to support each type of exemption. a copy of a valid Energy Performance Certificate for the property. A description of why the landlord has been unable to obtain adequate ‘no cost’ funding. Optionally, the landlord may also provide a copy of any evidence on which the landlord relies to demonstrate that they have been unable to access relevant ‘no cost’ funding to fully cover the cost of installing the recommended improvement or improvements. This evidence of a landlords inability to access relevant ‘no cost’ funding may include a notification from a Green Deal provider advising that no Green Deal finance is available for a recommended measure, or that funding is only available to partially cover the costs. Please Note: The Government has decided to replace this exemption with a cost cap of £3500 inc VAT. An implementation date for this is yet to be confirmed by Parliament. A copy of the relevant report to demonstrate this (if separate to the relevant EPC). A copy of the written opinion of a relevant expert stating that the property cannot be improved to an EPC E rating because a recommended wall insulation measure would have a negative impact on the property (or the building of which it is a part). A copy of any correspondence and/or relevant documentation demonstrating that consent for a relevant energy efficiency measure was required and sought, and that this consent was refused, or was granted subject to a condition that the landlord was not reasonably able to comply with. Please Note: Where the party who withheld consent was a tenant, the exemption will only remain valid until that tenant’s tenancy ends. When that tenant leaves the property (or after five years, whichever is soonest) the landlord will need to try again to improve the EPC rating of the property, or register another exemption, if applicable. A copy of the report prepared by an independent RICS surveyor that provides evidence that the installation of relevant measures would devalue the property by more than 5%. the circumstances under which they became the landlord. Please Note: Where a person wishes to register an exemption upon recently becoming a landlord, the exemption will last for a period of six months. Do I have to make particular improvements like those listed on the EPC? Are there any recommended or required materials which should be used to undertake the improvement works? There are no specified materials or improvement measures; a landlord is free to do whatever they like with their property so long as the EPC rating can be raised to meet the Minimum Energy Efficiency Standard. The most assessable source of advice would be the recommended measures section on EPC for the property, but landlords can seek advice from other suitably qualified experts if they wish. Are Houses in Multiple Occupation (HMOs) excluded from the PRS Regulations and MEES? HMOs are not excluded from the Energy Efficiency (Private Rented Property) (England and Wales) Regulations 2015. The Regulations apply to all privately rented properties that are legally required to have an EPC, and where rooms are let on one of the qualifying types of tenancy (most likely assured tenancies). An HMO will be in scope where it meets these criteria. NB: Many HMOs are run on a commercial basis and as such are business premises. Where this is the case they would normally require a non-domestic EPC like a hotel, hostel, care home or student accommodation block rather than a domestic EPC. What exemptions exist for MEES (Domestic Buildings)? Whilst the exemptions are relatively straight forward, applying them is more complex and can also involve understanding the separate regulations that apply to both Energy Performance Certificates and the Minimum Energy Efficiency Standards. There are some organisations suggesting that landlords can easily avoid improving their buildings by claiming an exemption. Our experience is that this is more difficult than it first appears and could easily cost more than improving the building to meet the standards. Buildings that have not been legally required to have an EPC. These can include some listed buildings (see our specific notes on this topic), temporary properties, some HMOs and holidays lets. It will also apply if the property has not been built, sold, let or significantly altered since the introduction of EPCs. Buildings without a valid EPC. This would include buildings where the EPC is over ten years old when it is relied upon for the MEES regulations. Buildings only with a voluntary EPC. An EPC may have been lodged for any number of reasons. EPCs completed for purposes other than the construction, sale, let or significant alteration of the building, including those lodged in a mistaken understanding that one was required, are known as voluntary EPCs. A building is only subject to MEES if the EPC was legally required. NB: There is currently no way to tell this from the EPC itself and so you will need to know the history of whether or not the building has legally required an EPC. Buildings occupied solely under licence. MEES only applies to buildings occupied under a “Relevant Tenancy”. This includes an assured tenancy, a regulated tenancy and domestic agricultural tenancies. If the occupier is present only under a licence to occupy the MEES requirements will not apply as there is no tenancy. Social housing schemes. The regulations apply only to privately rented properties. Social housing is exempt from MEES regardless of its condition, quality, or EPC rating. There are a number of circumstances where an exemption or multiple exemptions from making improvements can be claimed. Where an exemption of this type is claimed, it may be possible to continue to rent out a substandard property. However, all exemptions of this nature must be lodged on the PRS Exemptions Register. Additionally, it should be noted that specific supporting evidence is required before registering an exemption on the PRS Exemptions Register. We can provide specialist advice in this area as part of our service but would always caution clients that meeting these requirements can cost significantly more than making improvements to meet the MEES. This will obviously depend upon the building and the improvements required but changing a few lights will likely be cheaper than obtaining professional services to prove a property will be devalued for example. Registered exemptions are also non-transferable. At best they are valid for a maximum of five years but a change in tenant or sale to a new landlord will normally mean the process (and costs involved) will have to be repeated. Only then can new exemptions be registered. There are also significant penalties for making a false or misleading declaration on the PRS Exemptions Register. All relevant improvements have been made – Where all the improvements suggested have been made and the property still remains below the MEES. Incompatible wall insulation improvements – Where independent experts conclude that it is inappropriate to make the wall insulation improvements suggested as they would have a negative impact on the structure or fabric of the property (or the building of which it is part). Improvements which cannot be financed without cost to the landlord – Landlords are not required to make improvements where relevant “no cost” funding is not available. However, they must attempt to take advantage of funding that is available and must be able to demonstrate this. Improvements that do not meet the new “Golden Rule” for Green Deal funding may fall within this exemption but only if alternative funding is not available. Devaluation of the property – You are not required to make an improvement where an independent surveyor determines that making it would devalue the property by more then 5% of its current market value. Third Party Consent is refused – Where there is a sitting tenant you might complete the formal process required in offering to improve the property and consent may be withheld. Equally, you may require consent from a superior landlord, a bank or building society or the local authority which may be reasonably refused. However, you will have to demonstrate that you have applied for permission and have tried to accommodate any reasonable restrictions that they have placed upon you before you can claim this exemption. This exemption can also be used where planning, conservation or other consents are required from statutory authorities providing it can be demonstrated that these have been applied for and refused. Please note that every suggested improvement must be considered individually for the purposes of claiming exemptions. It is therefore highly likely that, even where some improvements may be subject to exemptions, others will not. In this situation, some improvements to the building will still need to be made. What exemptions exist for MEES (Non-Domestic Buildings)? Buildings that have not been legally required to have an EPC. These can include non-domestic buildings with a low energy demand, some places of worship, some listed buildings (see our specific notes on this topic), temporary properties and holidays lets. Buildings without a valid EPC. This would include buildings where the EPC is over ten years old when it is relied upon for the MEES regulations and those where an EPC has never been completed. Buildings only with a voluntary EPC. An EPC may have been lodged for any number of reasons. EPCs completed for purposes other than the sale or let of the building, including those lodged in a mistaken understanding that one was required, are known as voluntary EPCs. A building is only subject to MEES if the EPC was legally required. NB: There is currently no way to tell this from the EPC itself and so you will need to know the history of whether or not the building has legally required an EPC. Short tenancies. This applies to tenancies of less than six months with no right of renewal. Long tenancies. This applies to tenancies of over 99 years. No improvements are possible – Where independent experts conclude that it is impossible to make the improvements suggested on the EPC as they are physically incompatible with the construction of the property or would damage it. Third Party Consent is refused – Where there is a sitting tenant you might complete the formal process required in offering to improve the property and consent may be withheld. Equally, you may require consent from a superior landlord, a bank or building society or the local authority which may be reasonably refused. However, you will have to demonstrate that you have applied for permission and have tried to accommodate any reasonable restrictions that they have placed upon you before you can claim this exemption. The Seven Year Payback Test – It is expected that any improvement made will recoup its cost within seven years from the savings that will occur in the subsequent energy bills. The Government has defined a specific methodology for calculating this and the guidance advises most landlords to engage the services of a competent professional to perform these calculations on their behalf. If it can be demonstrated that the improvement does not meet this requirement an exemption can be claimed. What are the Minimum Energy Efficiency Standards (MEES)? The Minimum Energy Efficiency Standards (MEES) for England and Wales are set out in The Energy Efficiency (Private Rental Property) (England and Wales) Regulations 2015. These regulations were made as directed by The Energy Act 2011. Scotland has its own system for improving the energy efficiency of buildings which includes the Section 63 requirements for large non-domestic properties. These regulations, providing only for a few specific exemptions, require that all privately rented properties must meet of exceed the minimum standards set. This is established in terms of the EPC rating for the property and has initially been set at an “E” rating. As the regulations take effect it will be increasingly difficult to let properties with an “F” or “G” rating without first improving them. the new Minimum Energy Efficiency Standards (MEES) for domestic buildings are now in effect throughout England & Wales. Landlords are now unable to sign a new lease, renew a lease or extend a lease unless the building either achieves an EPC rating of at least E or a permitable exemption is registered. From 1st April 2020 it will be unlawful to continue to let a domestic property which has legally required an EPC without an EPC rating of at least an E unless a permitable exemption is registered. Baseline EPC - Have all your flats, apartments and houses surveyed by a reputable assessor with specialist additional insurance and have EPCs (at least in draft) produced that represent them all in their current state. This will help to identify properties that might be at risk now or in the future giving you a baseline for your portfolio no matter what its size. Lodge Good EPCs - Decide the minimum standard you want to achieve for your portfolio. You can then get the EPCs that achieve this rating lodged on the National Register. Under the current rules, they will then be valid for the next ten years. Obtain Refurbishment Reports - For the remaining properties, obtain expert advice and modelling to find the most cost-effective ways of getting these up to standard. There are often cheaper and less disruptive ways of improving the building and increasing its EPC rating than making the minimum improvements suggested on the EPC. We provide this service in the form of a EPC Refurbishment Report which explains your current position and provides possible improvements you could make to meet the MEES. Improve Less Efficient Properties - You can now plan the improvement of less efficient properties in your portfolio. You can potentially achieve this at the tenant’s expense through Green Deal Finance. Once the improvements have been made, get a new EPC completed and lodged. Protect Your Asset - Having got your property up to standard don't let your tenants downgrade your rating. Seek legal advice and add tenancy terms that protect the EPC rating of your property. Make tenants seek permission for changes and prohibit them from commissioning their own EPC for lodgement on the National Register without your permission as you don't want your good EPC overwritten with a poorer one. Compliance is an ongoing process and we can help advise you as to the sorts of changes that will affect the EPC rating. We can also evaluate proposed changes to a property to see what the effect on the EPC will be. When you come to us we will only charge you for the work we have to actually complete to help you achieve compliance. Initially we can check your portfolio to see which properties need to be surveyed and which already appear to have appropriate EPCs. We can also undertake sample checking to confirm the accuracy of the EPCs if you wish. At each stage we only take forward the properties you instruct us to, you don't have to commit to the entire process for your whole portfolio in one go helping you spread the cost and target your most valuable or at risk properties. If you are interested in finding out more about how we can help your portfolio meet the new Minimum Energy Efficiency Standards (MEES) please contact us to discuss your specific requirements. We also provide services for non-domestic properties and so can also handle mixed property portfolios. What is the “cost cap” for domestic MEES? When are improvements “too expensive”? Originally, the idea was that improvements would only have to be made to domestic properties if they could be achieved “at no cost” to the landlord. This policy depended upon various forms of funding being available to landlords to make any necessary improvements. Following the effective collapse of Green Deal funding and the withdrawal of many grants, the Government launched a consultation in December 2017 to review this policy. This occurred just before the Energy Efficiency (Private Rented Sector) (England and Wales) Regulations 2015 began to take effect in April 2018 therefore little actual evidence was available about their real impact. The consultation ran until March 2018 with summary responses being published in July 2018 before the Government responded with new policy in November 2018. The new policy effectively requires landlords to spend up to £3500 inclusive of VAT (the cost cap) per property after October 2017 in order to bring it up to the Minimum Energy Efficiency Standard (MEES). a new tenancy to an existing tenant. From 2020, the amended regulations will apply to all privately rented property in scope of the regulations, in line with the existing regulatory ‘backstop’ date. I’m a domestic landlord, what do I need to do for MEES? 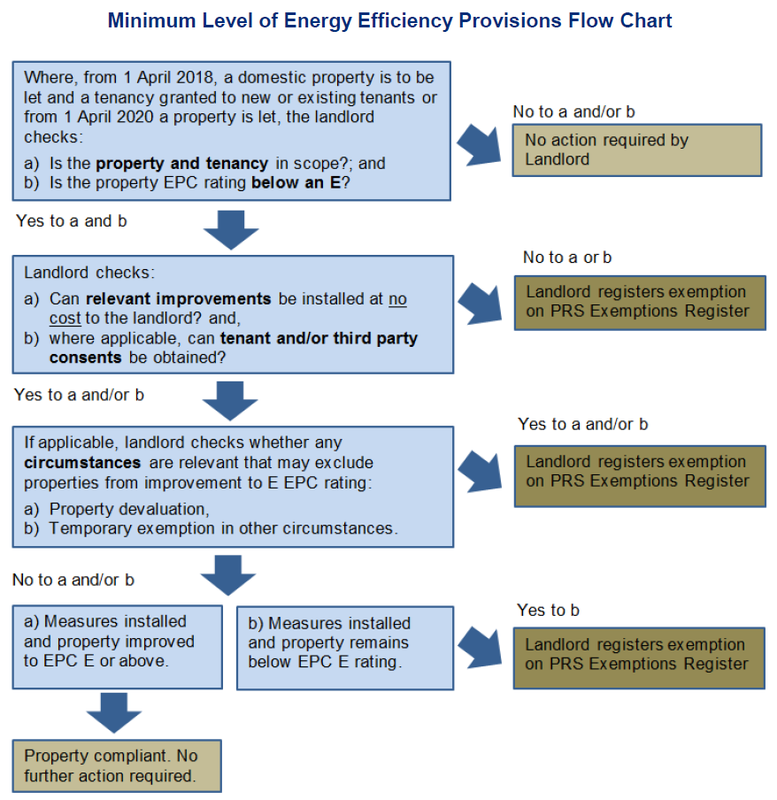 Complying with the Energy Efficiency (Private Rented Property) (England and Wales) Regulations 2015 and MEES can seem more than a little daunting. However, the Department for Business, Energy & Industrial Strategy have simplified the process into a single flow chart to help. Combined with expert advice and support, this chart will help guide landlords through the process required to comply with the regulations. Source: Page 81, Guidance for landlords and Local Authorities on the minimum level of energy efficiency required to let domestic property under the Energy Efficiency (Private Rented Property) (England and Wales) Regulations 2015, BEIS (Oct 2017). Do I need to get my tenant’s consent to make improvements? There is no specific requirement in the Energy Efficiency (Private Rented Property) (England and Wales) Regulations 2015 for a landlord to seek tenant consent to carry out works. However, depending on the terms of the tenancy agreement between a particular tenant and landlord, the landlord may need to obtain tenant consent before undertaking certain works (energy efficiency related or otherwise). Where this requirement already exists, the PRS Regulations recognise that consent should be obtained before work is undertaken. This is considered entirely compatible with the requirement to allow a tenant quiet enjoyment of the property. Between April 2018 and April 2020 landlords are only required to improve F or G rated properties before signing a new tenancy agreement. In their guidance the government states that they expect “many landlords will make improvements while a property is vacant between tenancies” and that therefore “tenant consent may not be a consideration”. The guidance issued goes on to consider this area in more detail. “One issue which landlords should consider is whether or not they have the right to carry out improvement works under the terms of an existing tenancy. Landlord rights of entry to undertake work on a property typically only extends to the carrying out of repairs or maintenance, rather than making ‘improvements’. As a majority of the measures landlords can install to meet the minimum standard will be considered improvements, a landlord may not have an automatic right of entry to install the measure or measures, and tenant consent may be necessary. Additionally, landlords are reminded that they are under an obligation to make reasonable efforts to obtain third party consents and should not behave in such as manner as would discourage third party consent being granted. “The Regulations require the landlord to make ‘reasonable efforts’ to obtain third party consent. Reasonable efforts may include attempts on a number of separate occasions and using a number of different available means of communication to secure agreement from, for example, a tenant or superior landlord, with evidence to show this had been done (in the case of planning consent refusal, evidence of a single application and subsequent refusal is likely to be sufficient evidence). Are holiday lets and hotel rooms covered by MEES? Holiday lets, together with rooms in hotels and bed & breakfast accommodation are typically let under a licence to occupy, rather than a tenancy. Therefore, this type of rental property is normally outside of the scope of the Energy Efficiency (Private Rented Property) (England and Wales) Regulations 2015 and not required to meet the MEES. If there are any concerns about whether a property is occupied under a licence or a tenancy, and whether the landlord is subject to the Regulations, independent specialist legal advice should be sought. What types of tenancies are covered by MEES? Does it apply to properties occupied under Licence? An assured tenancy (including an assured short hold tenancy) defined in the Housing Act 1988. A regulated tenancy defined in the Rent Act 1977. An agricultural tenancy as set out in the Energy Efficiency (Domestic Private Rented Property) Order 2015. The Energy Efficiency (Private Rented Property) (England and Wales) Regulations 2015 only apply to tenancies in the private rented sector. They do not apply to properties owned by councils and social landlords. Similarly, they do not apply to properties occupied under licence without a qualifying tenancy. What are the penalties for domestic buildings? Letting a sub-standard property for less than three months when the penalty notice is served – A fine not exceeding £2,000 and publication of the penalty. Letting a sub-standard property for three months or more when the penalty notice is served – a fine not exceeding £4,000 and publication of the penalty. Registering false or misleading information in relation to an exemption – a fine not exceeding £1,000 and publication of the penalty. Failure to comply with a compliance notice – a fine not exceeding £2,000 and publication of the penalty. Where a combination of offences have been committed by a landlord in relation to a single dwelling the fine is capped at a maximum of £5,000. Where can I find more information about MEES? There are lots of independent sources of information about the new Minimum Energy Efficiency Standards (MEES). However, we have found many seem somewhat misleading and/or hold a significant bias. Here at Rowleys Commercial Energy Assessments Limited we believe it is important to provide information that is as accurate and unbiased as possible to enable those affected to form their own opinion as to the actions they should take. As such, we would refer you to the original regulations and the official guidance published by the Government. These are the same sources that we primarily rely upon when advising our clients. Having read the original sources you may wish to consider further analysis. The articles below are publicly available and offer some analysis of particular aspects of the standards. Please note that we cannot accept any responsibility for the accuracy or content of external sites. What are the legal implications of MEES? We know our limitations and we are specialists in energy efficiency. As such we are not in a position to provide legal advice. Whilst we can highlight some of the issues that you may face, we’re sorry but you will need to obtain specialist legal advice to fully understand the legal implications of MEES on your portfolio. What is a Domestic EPC? How long is it valid? 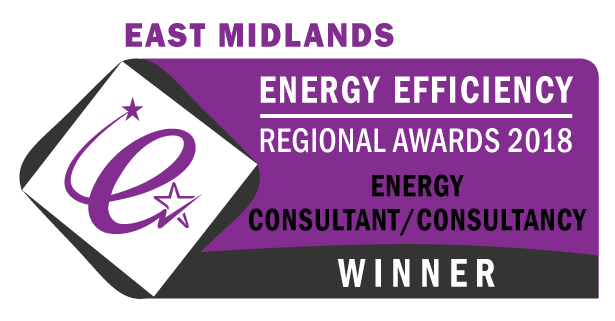 A Domestic Energy Performance Certificate (commonly called an EPC) contains information about a property’s energy use and typical energy costs. It also provides recommendations about improvements that can be made to reduce energy use and save money. An EPC gives a property an energy efficiency rating from A (most efficient) to G (least efficient) and is valid for 10 years.